Ljubljana, 4 and 5 July 2018 – Government Office for Development and European Cohesion Policy (GODC) conducted public consultations with all key stakeholders to make decision-making and the programming of “Enhancing Human Capital” programme and “Climate Change Mitigation and Adaptation” programme as inclusive, transparent and accountable as possible. GODC is responsible for preparing the Concept Note for both programmes prior to their implementation under the EEA and Norway Grants in its role as Programme Operator. GODC has been working closely with ministries and regional development agencies to carry out an analysis of the current situation and needs, and identify potential challenges in relation to the main objectives of each programme. 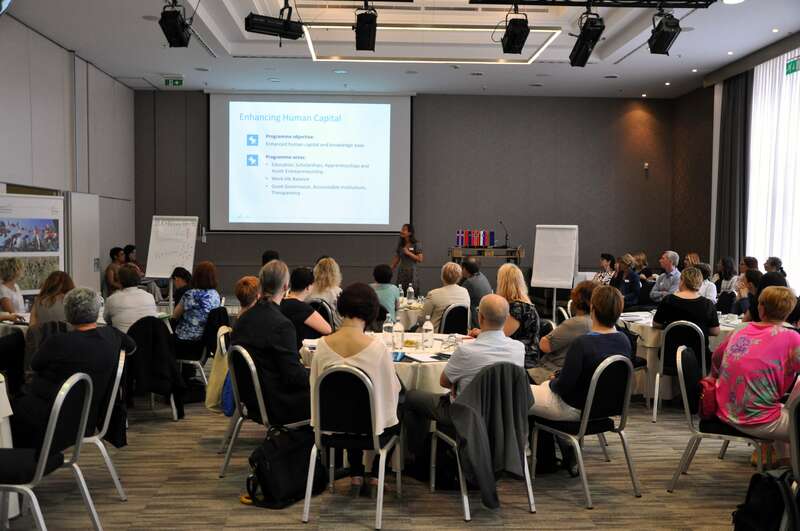 One of the steps of preparing the Concept Note for each programme are consultations with key stakeholders which took place on 4 and 5 July 2018 in Ljubljana. The purpose of consultations was to present the process of programming, challenges and proposed strategies. The participants were asked to identify the main problems and give possible solutions to each programme. In addition to the representatives of the Programme Operator, Donor Programme Partners (Norwegian Centre for International Cooperation in Education and the Norwegian Environment Agency), the Financial Mechanism Office, the National Focal Points, the Royal Norwegian Embassy in Budapest and the European Wergeland Centre, another 40 representatives from a diverse range of key institutions from the public and private sectors and civil society in the field of education (4 July) and environment (5 July) took part in each consultation. During the consultation on “Enhancing Human Capital” programme, participants discussed the challenges and solutions for improving the competencies of teachers and other professionals in the areas of formal or non-formal education, work-life balance, integration of youth into the labour market, precarious workers, and intersectoral cooperation. Participants in the consultation on the “Climate Change Mitigation and Adaptation” programme sought solutions in the areas of ecosystem restoration and the use of ecosystem services, circular economy, renewable energy sources and sustainable mobility. The conclusions of the consultations make a valuable contribution to the preparation of the Concept Notes of the two programmes, prepared and coordinated by the Programme Operator together with Donor Programme Partners and Financial Mechanism Office, and submitted to the donor states for approval. The Concept Note of the programmes will serve as the basis for the singing of the Programme Agreement which lays down the implementation of each programme, and represents the framework for the preparation of calls for proposals.